I’ve received quite a few emails from visitors to this site telling me that in the later printings of Sichuan Cookery (published in the US as Land of Plenty), I promise to post information about suppliers on this website. I’m embarrassed to say that I had completely forgotten about this, but I can see that it would be useful for anyone trying my recipes. So I’ll try to start on this fairly soon. I’ll only be able to list suppliers for Londoners at the moment, but perhaps if I post details of some favourite brands, those of you living outside London will be able to find them in your own, local Chinese supermarkets. And of course any of you can contribute to the post by leaving comments. Please be patient, and apologies for not having posted the relevant information before! We have used Fuchsia’s Szechuan and Hunam books with delicious success. In the New York metropolitan area many of the ingredients,including meat, fish, groceries and vegetables can be found at the Hong Kong Supermarket in Flushing on Main Street near 37th Avenue-one hour free parking on weekends!! One of the biggest difficulties in the US is finding the “facing heaven” peppers. I’ve only seen them in London — none of the markets in San Francisco that I’ve visited have them, they have the “five finger” peppers. James, have you tried looking for ‘birds eye (birdseye) chillies’ or tsi tian tsiew (cantonese pronunciation)? You might have better luck, as they are relatively easy to find in the UK. If you live near cardiff theres a shop called Cardiff Korean and Japanese Foods. Its at 147 Woodville road in the Cathays area. It sells facing heaven chillies and really good quality sichuan peppercorns. I was very excited when I stumbled on this place as I had no luck online trying to source the facing heaven chillies. This little place is a delight. Who said you can’t get good food in the UK? James- facing heaven peppers, at least in their dried form are available in New York. After reading about the elusive Camellia Oil that Fucshia mentions in her Hunan cookbook I did a search of all the local Asian grocers in Melbourne, Australia. After a long search I eventually found it in Mihn Phat Asian Supermarket in Nicholson St, Richmond. I have used it in several dishes and made chilli oil with it. Light jade in colour and has a clean light slightly nutty flavour. Has a hard to describe non oily feel and taste about it which I have not seen in other cooking oils before. I was quite impressed with it in my stir fries and will be using it in the future as long as I can find it. Price wise it was very cheap for such a rare product over here. After trawling the myriad of Chinese supermarkets in Manchester (UK) I think I can say that W H Lung on Upper Brook St is the best for Sichuan ingredients. They have proper Pixian chilli bean sauce, sweet bean sauce, and a good variety of Sichuanese preserved vegetables. Woo Sang in Chinatown is the only place I’ve seen dried chillies that were clearly labelled as being from Sichuan though. Today i finally found Ya Cai at the Hong Kong Supermarket in East Brunswick New Jersey; the packages were the exact same ,”SUIMIYACAI” made in Yibin, as earlier given to me by the Little Pepper Restaurant in Flushing. Right next to it were packages of Pickled Chilis. facing heaven chillies back in stock online! Hi there – any further updates from Fuchsia or anyone else? In the UK, Manchester’s WH Lung stocks Sichuanese chillies that look similar to facing heaven chillies, although not labelled as such. 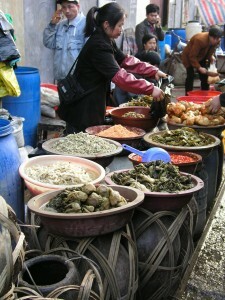 They also have several Pixian fermented broad bean sauces and yang jiang preserved black beans with ginger. Any Californians out there? The Asian shops around me (Pasadena) are mostly Korean and don’t carry a lot of my spicy staples…does anyone have recommendations? Or a good online store? In the UK try http://www.steenbergs.com for facing heaven chillis and sichuan pepper. Lots of other good thngs too…and mostly organic, if that matters to you. Looking for sources in the US for Camellia oil and tangerine peel. The oil I can understand not finding, but not the peel. Am I calling it by the wrong name. I could make my own I suppose but would then have to wait for it to age (how long?). Okay- seriously, what are facing-heaven chills!??! Even showing the Chinese-language characters at asian markets bears no results- they just grab a bag of dried red thai chilis and hand them to me. Seems to be that they’re nigh upon impossible to find in the States- anyone have any leads? I was just given Fushia’s Sichuan Cooking for Christmas by my wife as BarShu is my favourite Chinese restaurant in London, but sadly I now live in the wilds of Suffolk. So a trip to Chinatown/Lisle Street is quite a trek. But I have managed to find most of the ingredients mentioned in the book at http://www.souschef.co.uk which seems to stock an amazing variety of exotic ingredients. They sell bags of ‘Sichuan Dried Chilli’ which they say are also known as ‘Long Chillis’ or Facing Heaven Chillis’. But I’m not sure if these are the right ones as Fushia describes them in her book as ‘short, plump, lustrously red chilli’. The Chillis here http://www.chillipepperpete.com do seem to fit the bill, though quite pricey.